Winemakers rely on the soil, weather, and other natural elements to produce their wines, so it's no surprise that many have turned to eco-friendly and sustainable practices to protect their vineyards and reduce their environmental impact. Although California leads the way, the rest of the nation's wine-making regions are following suit. Here are five wineries that have embraced the movement. Looking to preserve his southern Arizona vineyard for future generations, winemaker Kief Joshua Manning takes a holistic approach to farming. He composts, plants cover crops, and recycles waste, including the wine barrels that are sold as end tables and bottle racks at the winery. But, it's the way he shuns both pesticides and herbicides that caught our attention. Manning uses Baby Doll sheep to eradicate weeds in the vineyard, predatory birds to hunt gophers and rodents, and praying mantis to eliminate other insects. Composting, recycling, and natural pest management is just the starting point for Pedernales Cellars. By building underground, this Texas Hill Country winery takes advantage of the area's natural limestone to provide a cool and steady environment for case storage, slashing the facility's energy consumption in half. Removal of invasive plant species and cedar overgrowth from the property has also led to the reemergence of previously lost seeps and springs. An added bonus? The tasting room features local and sustainable products like Bella Vista Ranch's olive oils and t-shirts made from renewable bamboo fibers. Rather than rely on state-of-the-art technology for an eco-friendly wine making facility, the New Kent Winery turned to the past. 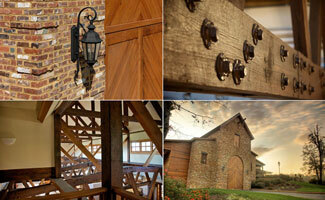 Much of the winery's 17,000-square-foot building is constructed from historic, reclaimed materials. Pine trusses came from a 1901, Richmond train depot; a mid-1800s Connecticut warehouse provided the flooring; and handmade, pre-Civil War bricks form the building's facade. Recycling these materials not only helped save the environment but also preserved history. In 1976, Miljenko "Mike" Grgich put California wines on the map when his 1973 Chateau Montelena Chardonnay outscored French wines in the infamous Paris Tasting. Today, at age 90, he is pioneering the use of solar power in wine making. At peak production, the winery's 860 photovoltaic panels can provide nearly 100 percent of its electrical needs and what isn't used is exported to the grid. Grgich Hills Estate, which implemented organic farming at its five estate vineyards in 2000, also utilizes natural cork in its bottling process and relies on wild yeast fermentation. Located in the Finger Lakes' region of New York, Four Chimneys Organic Winery eschews the use of any toxic or synthetic in the wine making process. Instead of pesticides, the winery releases ladybugs, lacewings, and other beneficial bugs into the vineyard to attack grape predators. Instead of herbicides, workers pick weeds by hand and tractor. And, instead of fungicides, the winery employs natural methods including their nutrition to help the plants' immune systems to naturally defend against fungus. Since studies have shown that grapes produce powerful antioxidants when they resist fungus, Four Chimneys claims that by forgoing fungicides, they produce wines with additional health benefits.